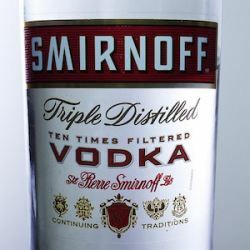 Smirnoff, a vodka brand, has tried to place itself under a health halo by claiming it is not only gluten-free but non-GMO as well. That's true, it will now be both of those things - corn, the key ingredient in their vodka, never had gluten. But most U.S. corn is genetically modified. And that is a good thing. Unless you know nothing about science and have terrible taste in vodka, which seems to be the demographic British company Diageo is virtue signaling toward. Genetically modified corn carries a gene that naturally creates an insect toxin (Bacillus thuringiensis - Bt), which is sprayed liberally by organic farmers on their crops. You read that right, organic farmers will douse plants in a chemical which they claim turns corn into Frankenfood if it's naturally expressed inside the plant. Don't sweat the spraying any more than you worry about GMOs. Bt cannot harm any mammals, which is us. It is biologically impossible to be harmed by it unless you fall into a vat of it and drown. So why claim it is better to use non-GMO corn, when it is better for the environment? That's marketing, they believe their customers want that. And it may be their downfall. As Stephan Niedenbach notes, FDA lets organic food and supplements have a Wild West for Woo when it comes to labels, as long as they state somewhere FDA has not approved their cosmic claims, but alcohol is another issue. Making a gluten-free health claim will pass muster even if its ethically disgusting. Corn has no gluten anyway but celiac disease is a health issue and customers can be made aware of products without gluten. But GMOs are not a health issue, when USDA created the "organic" food standard they even said it was solely for marketing. If they do market “non-GMO” as a health claim, that is prohibited by the Treasury Department's Alcohol and Tobacco Tax and Trade Bureau. As the site alcohol.law notes, "be sure to keep the TTB’s position in mind before submitting a certificate of label approval with any “GMO” related terms or references." This may be another reason for FDA Commissioner Scott Gottlieb, M.D., to show leadership and place the non-GMO labeling free-for-all in his sights. The problem he will have is that while food labeling is an FDA issue organic food itself falls under the domain of USDA and alcohol is under the Treasury Department. USDA has shown they are going to protect any farmer from anything, even if it's organic farmers deceiving the public on their labels, so they won't be any help. And if TTB dismisses non-GMO as marketing, no different than if a vodka company puts Premium on their label, there can be no fight. But it will also mean another government agency has dismissed concerns about GMOs as just an advertising scam.